Fuel costs rose sharply in 2005 due to hurricane damage to offshore platforms and refiners in the gulf and international developments in the oil supply market. Competing fuels – coal and natural gas – rose in price in lockstep. The days of $5/ MM Btu natural gas are now a memory, and a client reported a delivered natural gas price of $17/MM Btu in the northeast. This was in the fourth quarter of 2005, and was severely impacting their profitability. Operating firms with fuel as a high percentage of their costs are seeing profit margins erode. One solution to the problem is fuel switching and use of alternate, sometimes overlooked, fuels. There are many alternate fuels available in addition to gas, oil, and coal. These include used/recycled oil, used cooking oil, tires, wood, and solid waste. Some existing combustion systems were set up for multifuel firing and are easily switched, while others can be refitted and adapted to new fuels. Heat recovery is the other option, adding heat exchangers to current processes, or changing over to new types of equipment, e.g., from an elevated flare to a thermal oxidizer with a heat recovery boiler to recoup useful heat. This paper covers the heating value and other properties of alternate fuels, the changes required to fire them, and options for heat recovery. It also addresses in brief the regulatory aspects of fuel switching and impacts on emissions. Waste oil is collected, cleaned up, and sold as an equivalent to about a No. 4 fuel oil. "Specification oil" sells at a price below No. 2 fuel oil and slightly above No. 6 oil. Wood waste is used widely in the forest product industries, but has also been used by general industry in spot markets where excess wood fuel is available. Examples are textile mills and food processors in the southeast and independent power producers. Biomass (e.g., peanut hulls) has been burned in utility and other boilers. This is a spot market item and may only be seasonally available. Tires have been burned in cement kilns and in utility boilers. Issues here are transportation and size reduction costs, potential for state pass through of payments for disposal, and sulfur and ash content. Used cooking oil can be chemically treated and blended as 10% mix to make biodiesel. For industrial combustion applications, used cooking oil can be fired without chemical treatment and at 100% strength, with preparation being filtering and dewatering only. It, too, is a spot market item, and the normal end use is for agricultural feed. If there is an oversupply of used cooking oil remote from buyers, restaurants must pay to have it hauled off and the economics of diversion to industrial use are improved. Burning alternate fuels requires going back to the basics. We have to know fuel properties, know what the expected air to fuel ratio and excess air will be, and be able to predict flame and hot mix temperatures as well as stack gas flows. Higher sulfur will mean more SO2. For some fuels, such as wet wood "hog fuel," higher excess air (in the range of 50%) has traditionally been used in air swept stokers, much more than for oil and gas, which are usually in the 15-25% range. Used oil is produced by reclaimers throughout the US. It is frequently referred to as "spec oil" referencing US EPA terminology that allows its use as a product and takes it out of the waste category. Table 2 shows typical specifications for commercial sale of this fuel. Also see CRF 279.10 for more detail (http://ecfr.gpoaccess.gov; part 40, then part 266- 299). This EPA regulation also allows reuse of used oil on site by a generator (e.g., blending with diesel fuel for use in the company’s vehicles), and under these conditions, the fuel is not subject to EPA used oil or waste regulations. The asphalt industry and industrial and utility boilers are major users of used oil. It is interesting to note that AP-42 (US EPA's compendium of air pollution emission factors) assumes that half the SO2 that would be formed from sulfur in fuel oil is removed in an asphalt plant by the aggregate. Reduced SO2 emissions would be expected of other dryers and calciners that have alkaline reagents in the feed. From an engineering perspective, one must take care that such sulfur uptake would not have a significant negative effect on product quality. Note that waste fuels produced internally frequently have a negative value due to disposal cost. This can materially help project economics for installation of waste fired equipment (or cofiring in existing equipment) when savings in disposal costs are added to fuel savings. Gross Heating Value in Btu/lb = 14,544C + 62,028(H-(O2/8)) +4,040S-760Cl. Further information on waste and fuel testing can be found in the PowerPoint presentation "Matching the Process to Waste by Appropriate Testing: A Guide for Thermal Desorption Projects” at http://tmtsassociates.home.mindspring.com/presentation/index.html. Similar information on testing fuels can be found on the Chemical Engineering magazine website, (http://www.che.com) in a paper titled “Remediating Organic-laden Soils: Do Your Homework Before Breaking Ground," published 4/2/04. Beware that some elements can cause major problems even in small amounts. These include sulfur and chlorine that form acid gases, fuel-bound nitrogen that forms NOx, and sodium and potassium that can form low melting point ash. The ratio of fuel used to useful product made is of critical interest to combustion equipment owners. It can also be viewed as how much heat is captured in the load vs. that going elsewhere. It is frequently referred to in terms of efficiency, as in the fuel-to-steam efficiency for a boiler. Other terms are used in a given industry, e.g., for utility boiler/generators, it’s the heat rate, in Btu fired to produce a kW of power, for mini steel mills, kWh of electricity used per ton of steel produced, and for cement kilns, MM Btu per ton of cement clinker produced. For heat exchangers, the correct term is "effectiveness," but it is not unusual for people to use the term efficiency for heat exchangers too. A boiler is one of the simpler combustion devices to examine in terms of efficiency. See Figure 1 below. Looking at it from the standpoint of an "engineering control volume" and drawing a dotted line around the process, we have fuel going in and steam going out. So far, so good, but it’s not quite that simple. To go further, we need to consider the combustion air going into the burner and its temperature and humidity, the temperature of the stack gas going out (and mass of both), the heat lost in the stack gas, the temperature of the incoming boiler feed water, the temperature and flow of blowdown water from the mud drum, the shell (insulation) heat loss, and unburned fuel as carbon lost as CO and soot. Some of this is easy, for example, the stack gas mass is simply the weight of the combustion air plus the weight of the fuel burned, or as one of my teachers noted, the "Goes-intos" must equal the "Goes-outas." When working with boilers fired with natural gas, fuel oil, or propane, it's very easy to figure fuel to steam efficiency via the "short form" approach. It takes into account the major heat flows by difference, figuring heat loss for the stack, and assuming all the rest of the heat went into the steam. While being less accurate than the "long form" approach, it is useful for routine checking and tuning of combustion equipment. The long form approach would be used for such things as commissioning of a boiler and proving warranty provisions. As an example, consider a typical 125 psig saturated steam Scotch Marine Boiler firing natural gas with a flue gas temperature of 400°F, and a dry basis O2 concentration of 3%. Per the Figure 2 graph, the combustion efficiency is about 79% (equal to 100% input - 21% loss). 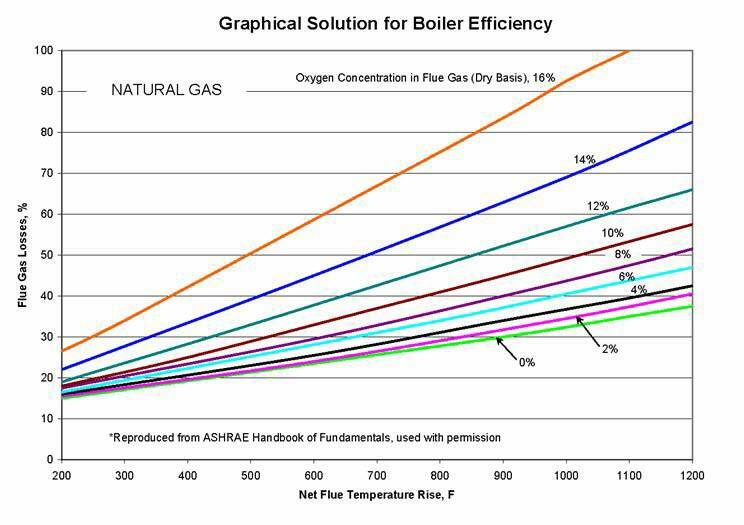 ASHRAE and other literature sources contain graphs for a multitude of fuels. If more accuracy is desired, or warranty provisions on big boilers must be proved, then detailed work can be done on all the thermal inputs and outputs using the "long form" test procedure. Stack gas CO2 or O2 levels are measured by CEMs (continuous emission monitors), hand held electronic field test instruments, or the old fashioned but dependable liquid Orsat absorbers. The graph at the following URL will allow you to convert CO2 and oxygen levels for various fuels http://www.bacharach-training.com/combustionzone/advantages1.htm. This is can also be calculated by hand given the C/H ratio of the fuel. Beware of acid gas attack of air preheaters and economizers used to preheat boiler feed water via heat exchange with stack gases! The graph that follows addresses this subject and will help keep you out of trouble. It gives you the acid gas dewpoint based on sulfur loading in the fuel. For example, natural gas with 200 grains (there are 7000 grains per lb) of sulfur per 100 ft3 of fuel (fuel gas) divided by the fuel heating value in Btu/ft3 of the fuel gas will have an acid gas dewpoint of 242°F at 20% excess air. Heat exchanger wall temperatures below that will result in liquid acid on the metal surface and heat exchangers will experience high rates of corrosion. If the original permit allowed firing of the alternate fuels (e.g., No. 6 oil as alternate to natural gas), then no repermitting would be required. However, to make sure it's covered, the permit application, the permit to operate, and any language in the Title V permitting (e.g., limits on hr/yr of operation to reduce NOx) should be checked. Some alternate fuels pollute less. For example, tests with used cooking oil showed lower CO and NOx emissions than fuel oil. So substituting this alternate fuel may require only notification to the regulators. Note that the above discussion applies to fuels and generally to non-hazardous waste. It does not apply to firing of RCRA "hazardous waste," where much more stringent rules apply, and permitting can take years. In the end, the relationship with the regulators is a critical element. With an ongoing, positive relationship, it may not take all that much paperwork to change fuels, as long as emissions do not rise past regulatory thresholds. Heat recovery is a routine process in industry. There are four primary types of heat exchangers (HX) used: Air to air; air to water; water to air; and water to water. An economizer is an air to water heat exchanger which heats feed water for a boiler using hot stack gas as the energy source. It is typically a series of finned tubes which are inserted into the stack. Air to air type HX are also used frequently, as in an air preheater for a boiler, taking energy out of the stack gas and preheating combustion air, or an air to air HX used in a catalytic oxidizer. Some boilers use both economizers and air heaters, but care must be taken to avoid dewpoint condensation from acid gases, e.g., with SO2 from burning high sulfur fuels. It is false economy to try to save money by recuperating energy only to end up spending it on downtime and maintenance! HX come in a variety of designs, such as co and counter current, single and multipass, plate type, spiral and shell and tube. Final choice is usually left up to skilled engineering or vendor personnel for a given application. Major issues occur when HX are misapplied, e.g., when fouling occurs in a HX which by design is difficult or impossible to clean. Heat recovery boilers do not have a radiant section and work via convective heat transfer, and usually on gases which are lower temperature (e.g., 1600°F) than in direct fired boilers. Efficiency suffers due to lower gas temperature and lack of radiant heat transfer, and they are typically 65% efficient, rather than the usually 80% plus for fuel fired boilers. Economics is usually poor at < 5 MM Btu/hr. Firetube types have hot gases passing through boiler tubes surrounded by water, all inside a steel shell. They are rarely used above 40 MM Btu/hr input, and 250 psig steam pressure. Watertube boilers are normally larger, and can produce higher pressure steam and sometimes superheated steam for power generation or higher temperature processes. For these, hot gases pass over tubes containing a water/steam mixture. While many argue what maximum hot gas temperatures are appropriate, for air to air exchangers failures are more frequent as inlet gas temperatures go above 1400°F, especially if the process has dust and aggressive chemistry (e.g., chlorides). Higher temperatures are possible with switched bed ceramic heat exchangers, as are used in the steel industry and for RTOs. Rotary heat wheels are used as an alternate to fixed HX for air to air service. While heat transfer calculations are normally run by the firms that manufacture heat exchangers and boilers, it is a good idea to get familiar with the theory and basic equations involved. Those in the trade use a term call heat exchanger "effectiveness," expressed in percent. Where C min is the smaller of m h cph or mc cpc, the hourly heat capacity, where m is the mass in lb/hr, cp is heat capacity in Btu/hr-°F, and h is hot stream and c is cold stream The rate of heat exchange is q = E C min x (T h in – T c in). Cascading is the use of heat from the exhaust of one source as the input to another process. This eliminates the cost and maintenance of heat exchangers. Two examples are rotary kiln exhaust used as direct or indirect heat for a pre-dryer to reduce load on feed to the kiln, and countercurrent firing in tunnel kilns, where hot gas entering the product discharge end flows over incoming cold feed material to preheat it. Switching to alternate fuels can save money. However, the properties of the fuel and end use application, potential changes in emissions and regulatory aspects must be considered before making the switch.